Traumatic amputations are a common combat injury. Soldiers report traumatic amputations as among the most emotionally disturbing forms of injury. 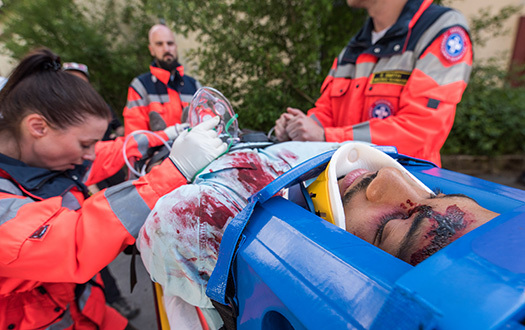 Fortunately, the survival rate associated with these severe injuries is unprecedented, due to improvements in immediate treatment and stabilization. Advances in the military arena are paving the way for better treatment of amputations by civilian EMS providers. 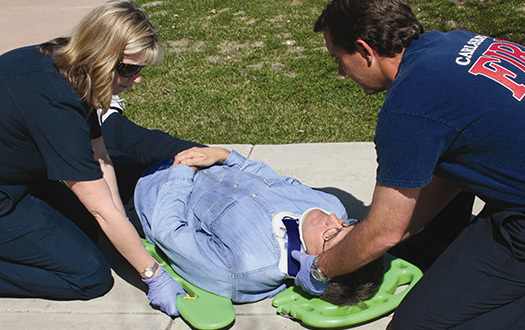 It is estimated that up to 83,000 traumatic amputations occur in the U.S. every year. Eighty percent of the victims are males between the ages of 15 – 40. Motor vehicle collisions are the most common culprit (51 percent) followed by industrial accidents (19 percent) and agricultural accidents (10 percent)1. The most common traumatic amputation is a partial hand amputation, with the loss of one or more fingers. The loss of one arm is the second most common traumatic amputation. Only about 10 percent of traumatic amputations are of the wrist and hand2. Amputations can be classified as partial or complete. A partial amputation occurs when some bone, tissue, or muscle keeps the amputated part attached to the body. Partial amputations are more common among civilians and usually do not require surgical amputation2. A complete amputation involves a complete sever from the body. Amputations can also be classified according to the degree of soft tissue, nerve, bone, and vascular injury. A sharp or guillotine amputation has well-defined edges which minimizes the damage to the associated anatomy. This type of amputated body part is easiest to reattach. A crush amputation has more soft tissue and arterial damage. Reattachment is less likely to be successful. An avulsion amputation is caused by forceful overstretching and tearing of tissue. Nerves and vascular tissue are torn away at many different levels from the site of separation. Limb salvage is unlikely due to the extensive damage. In general, the management of traumatic amputations is no different from other trauma patients. The first priority is to control major bleeding immediately. Tourniquets can be used when pressure and elevation fail. Evidence to support the use of tourniquets to control hemorrhage due to traumatic amputations in major limb trauma has been well established in the literature since 20083. Place the tourniquet as close to the amputation site as possible to limit ischemia and nerve compression of the extremity. Release the tourniquet as soon as the hemorrhage is controlled. Military care priorities have emphasized aggressive tourniquet use and early use of whole blood and blood products since 20095. The next priority is to maintain and support essential life functions. 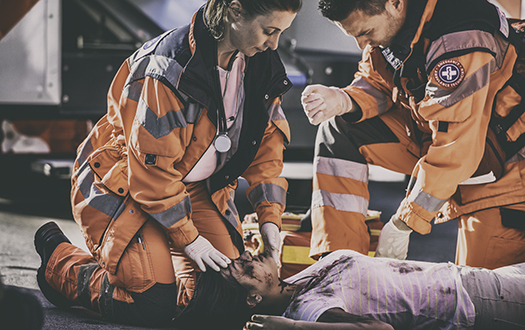 Supportive measures such as airway control, adequate ventilation, maintaining hemodynamic stability and body temperature can slow the onset of life-threatening shock. Recover the amputated part if possible. Remove dirt or debris from the amputated part and residual limb, which is the part of the body that remains after an amputation. Provide pain management and psychological support, and transport to the appropriate trauma center. Properly preserving the part is vital for successful replantation. If the finger or limb is still attached to the body, clean the wound surface with sterile saline. Gently place the damaged skin back to its normal position. Control bleeding and bandage the wound with bulky pressure dressings. If the part is completely detached, control the bleeding after cleansing the site by covering the wound with a pressure dressing. Wrap the amputated part in sterile saline soaked gauze and place it in a watertight container or resealable plastic bag. Place the protected part in an iced saline container. Do not allow the damaged part to come in direct contact with ice. 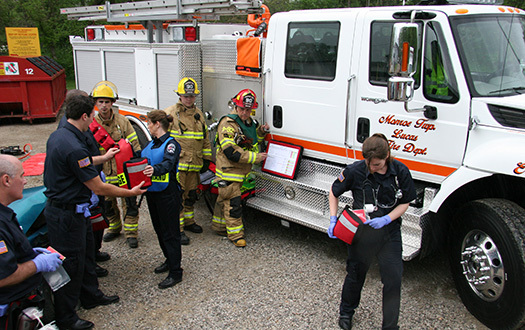 In civilian EMS, the primary assessment of airway, breathing, and circulation (ABC) take priority. Military care recognizes that a combat-related casualty is much more likely to die of hemorrhage than an airway problem. Priorities are changed from “ABC to C<>ABC” with the initial priority to halt life-threatening hemorrhage first. Therefore, the first ‘C’ in the military mnemonic represents “Catastrophic”6. 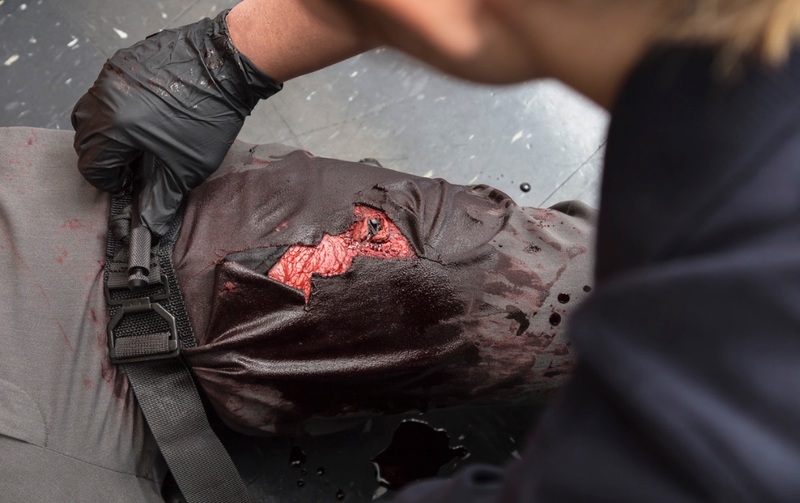 Military victims are more likely to experience multiple amputations and junctional bleeding than civilians due to the difference in trauma mechanisms. Junctional bleeding occurs between the trunk and the limbs (high level amputations) and between the pelvic area and legs. The most common type of junctional bleeding is groin hemorrhage. Traditional tourniquets are unable to be placed in these areas. Junctional tourniquets (also called truncal tourniquets or combat clamps, etc.) are fitted with target compression devices that can be specifically positioned over the injury site pumped up until the bleeding stops. Common uses of junctional tourniquets include controlling inguinal hemorrhage, controlling axilla hemorrhage, and stabilizing pelvic fractures. There are a wide variety of junctional tourniquets available on the market, but only a small handful have obtained FDA approval. They offer an opportunity to control severe hemorrhage in anatomical areas where traditional tourniquets are ineffective. The effectiveness of traditional tourniquets used in the treatment of severe uncontrolled extremity hemorrhage has been well established. Although many emergency providers testify to the success of junctional tourniquets, the data to prove that these devices improve patient outcome has yet to fulfill the rigors of science. Junctional tourniquets will no doubt be an area of ongoing evaluation and study by pre-hospital providers for years to come. 4. Rush, R. M., Arrington, E. D., & Hsu, J. R. (2012). Management of complex extremity injuries: Tourniquets, compartment syndrome detection, fasciotomy, and amputation care. Surgical Clinics of North America, 92(4), 987-1007. 5. Blackbourne, L. H., Baer, D. G., Eastridge, B. L., Kheirabadi, B., Kragh, J. E., Cap, A. P., ... Holcomb, J. B. (2012). Military medical revolution: Prehospital combat casualty care. Journal of Trauma Acute Care Surgery, 73(6), 5th ser., S372-S377. Dean Meenach, RN, BSN, CEN, CCRN, CPEN, EMT-P has taught and worked in EMS for more than 20 years and currently serves as Director of EMS Education/Paramedic Instructor and co-teacher in the Paramedic to RN Bridge Program at Mineral Area College. He has served as a subject matter expert, author, national speaker, and collaborative author in micro-simulation programs. Dean continues to serve patients part time as a member of a stroke team and in a pediatric and adult trauma center. He can be reached at dmeenach@mineralarea.edu.